The eighth track of Eat Me, Drink Me, 'Are You the Rabbit?' features two lines which previously appeared on Doppelherz, the short film accompanying The Golden Age of Grotesque. The first referenced lyric, "I know the insurance won't cover this" is taken near verbatim from its original debut as, "The insurance will not cover this". The second lyric, taken verbatim, is "I'm a kickstand in your mouth". 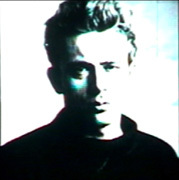 "Rebels without applause", a line taken from 'Mutilation is the Most Sincere Form of Flattery' is an allusion to the 1955 film, "Rebels Without a Cause", staring James Dean; a celebrity who appeared among many others in a series of flashing images during several performances throughout the Guns, God and Government world tour. The working title for said track was quoted by Manson as being, 'Rebels without applause'.